Every time you think this terrifyingly suspenseful family-on-the-run thriller can't possibly get more intense, it ups the ante with even scarier strangers-in-a-strange-land perils. The result is the most relentlessly edge-of-your-seat-exciting movie of the summer. 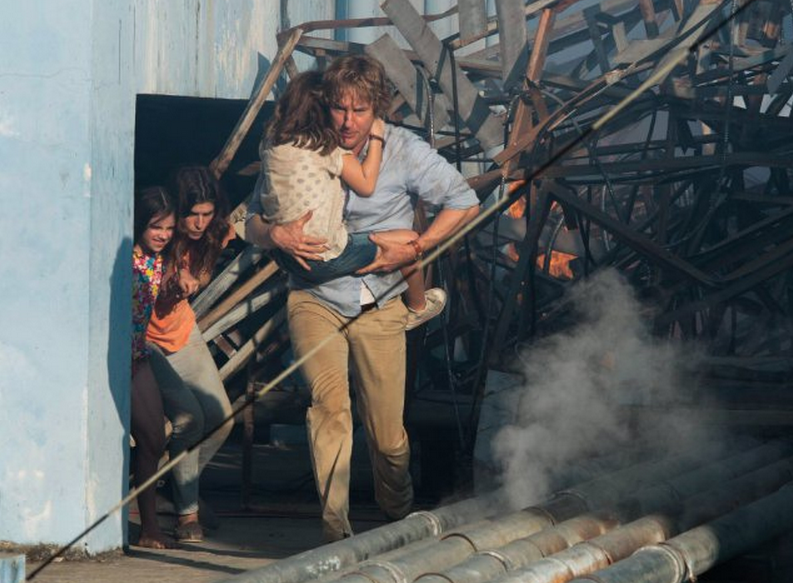 Less than a day after culturally oblivious American Jack Dwyer (a pleasantly rumpled Owen Wilson) arrives in an unidentified Thailand-lookalike country with wife Annie (Lake Bell) and their two young daughters, all violent-uprising coup d'etat hell breaks loose. Revolutionaries clash with soldiers, execute foreigners in the streets and storm the luxury hotel where the Dwyers are staying. The rest of the movie consists of the frightened family fleeing for their lives through a burning city filled with marauding murderers. Dark comic relief comes from a mystery man known only as Hammond (a bearded and rarely better Pierce Brosnan), whose extravagant outgoingness masks a bitterly world-weary cynicism. After meeting the Dwyers on the plane before their arrival, he becomes one of the only people they know who speaks their language and isn't trying to kill them. The run-for-your-life momentum of the minimalist plot is almost overwhelming, thanks to the skillful direction of John Erick Dowdle (who co-wrote the taut screenplay with brother Drew Dowdle). A scene in which the Dwyers have to toss their nearly hysterical daughters from one rooftop to another is heart-stoppingly powerful. There's also an army's worth of firepower on display, ranging from bullets to bombs to shells from a commandeered tank. Wilson and Bell do an excellent job of showing the frenzied parents' helplessness, resourcefulness and never-say-die determination. Sterling Jerins and Claire Geare are completely convincing as daughters Lucy and Beeze, perfectly conveying the girls' shame, confusion and horror, along with a requisite amount of pre-adolescent whining. The fact that the coolly capable Hammond and his local associate Kenny Rogers (Sahajak Boonthanakit) seem to have dropped in from another movie works surprisingly well, reinforcing the deliriously nightmarish situation in which the Dwyers find themselves. In nerve-shredding nailbiters like this one, an unlikely nick-of-time rescue or two actually feels merciful. The movie also is politically timely: The savage street mobs are reacting to their government literally selling out the country to oppressive American corporations. If it seems unlikely that Jack Dwyer wouldn't know why his new employer happens to be at the top of the revolutionaries' hit list, file it under "they hate us because we don't know why they hate us." "No Escape" is so effective at making the idea of international travel look absolutely insane that it may make you rip up your passport and vow never to leave home again. It's also one of the most emotionally wrenching and completely satisfying thrillers of the year.